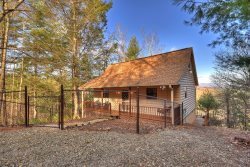 Appalachian Vista is a romantic and secluded cabin with an amazing view, outdoor fire pit, and Jacuzzi tub in master suite. 2 bed 2 bath private cabin that can sleep 4 adults with jacuzzi tub. 16/41: Master suite with panoramic window and leather chairs to take in amazing mountain view. Property Size 1,250 sq. ft.
Once you arrive and enter the Appalachian Vista Cabin you will see a beautiful fenced in front yard and cobble stone walk way to the front porch and entrance. On the front porch there are a couple of wicker chairs with a table and large porch swing at the other end. As soon as you enter you walk into the living room with a beautiful brown leather couch and large flat screen TV. Once we make our way through the living room we come to the dining room area with a table that could seat 6 if needed. From the dining room area we can walk into the large fully stocked kitchen with modern stainless steel appliances and gorgeous hand crafted breakfast bar to enjoy an early morning meal. To finish off the main level we must tell you about the bedroom with it's full sized bed and flat screen TV. There is also the perfect full bathroom with a custom tile shower enclosure and elegant vanity and mirror. We will head upstairs now to the jewel of this cabin the mater suite. Someone was thinking when they designed this home because the master suite has a gorgeous jacuzzi tub sitting in the middle of the room so you can soak away all your cares while gazing across the beautiful Blue Ridge Mountains through an oversized window. The bedroom is also eqipped with a private toilet and stand alone tile shower. The washer and dryer is behind the closet doors inside the master suite. Now that we are finished with inside and front yard of this magnificent cabin let me bring you to the one and only back deck. The view form here is absolutely breathtaking. The deck is equipped with an outdoor firepit and a propane grill. If you are looking for the perfect North Georgia Vacation Spot then look no further you have found it!